Charlotte Beers rose through the ranks from a research job at Uncle Ben's Rice to become the CEO of two worldwide ad agencies, Tatham-Laird & Kudner and Ogilvy & Mather Worldwide and undersecretary of state under General Colin Powell. Now working as a corporate troubleshooter and mentor for executive women, as well as conducting workshops in Europe and the United States, Beers offers an inspiring new path for women to follow to reach the leadership positions that have previously eluded them. Beers begins by exposing a serious problem: even though women make up more than half the workforce, they are still rare in upper management. She explains that education, hard work, and solid experience just aren't enough, and offers a solution by encouraging women to enhance their qualifications by building new kinds of relationships, ones that will help them to inspire and influence others in the more competitive and politically freighted atmosphere found at the higher levels of management. Beers contends that to accomplish this women must dive inside themselves to discover what really makes them tick, and learn to present that knowledge as they move up the ladder. 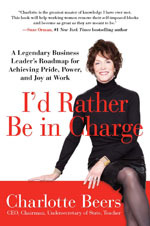 Complete with personal examples, anecdotes, and stories from successful friends like Martha Stewart and Suze Orman, I'd Rather Be in Charge presents advice in an intimate, honest style sure to help women attain and nurture the self-belief they need to begin forging their own paths to success. 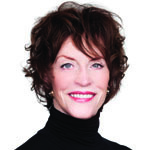 Texas-born Charlotte Beers credits the combination of her business insight and her innate Southern charm with her success. Her calling out of the difference between products and brands revolutionized major ad campaigns, bringing unprecedented success to her clients and the advertising agencies she lead. Harvard Business School continues to teach their bestselling case study on leadership titled "Charlotte Beers at Ogilvy." From 2001 to 2003, Beers served as Undersecretary of State for Public Diplomacy & Public Affairs under Colin Powell, taking on the task of bringing Brand America to the world, with special focus on the Middle East, and was awarded the Distinguished Service Medal. Today, she conducts seminars for women throughout Europe and the United States, showing women how to transform themselves into managers and leaders in the many industries they represent. She lives in Charleston, South Carolina.